Thank you for signing up to receive my art updates! My painting “Ball game” is on display at the Newburyport Art Association January 11 through February 2nd. Stop to see the show! The reception is on January 12th, 7-9pm. I'm participating in Holiday Small Works Show in the gallery at The Switchboard, featuring artwork from artists from the Merrimack Valley and beyond. The opening is on Friday, November 2nd. I'm excited that the “Kimono” painting was accepted and will be on display at the 10th Annual Figurative Competition and Exhibition at the Lore Degenstein Gallery (Susquehanna University). Thank you to the juror Lance Esplund, art critic for the Wall Street Journal, for including my painting in this prestigious show! 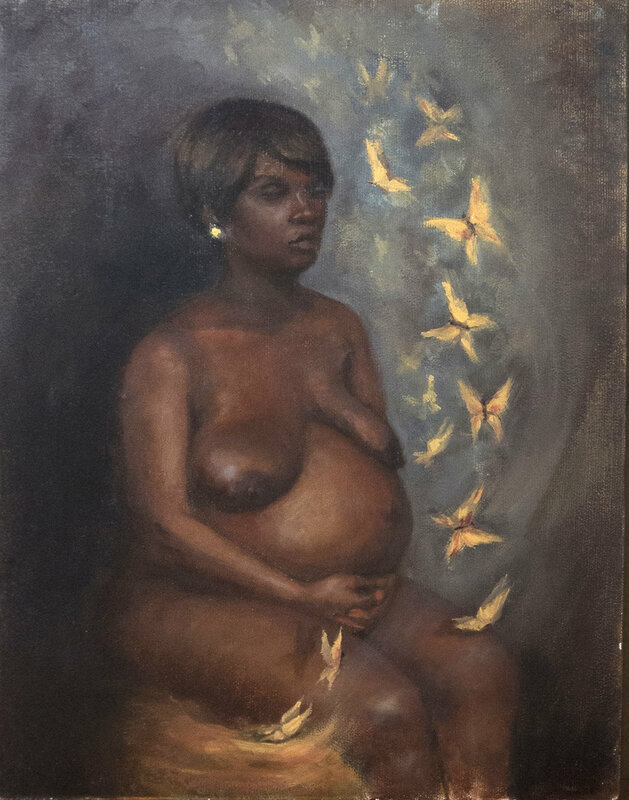 Opening reception Oct. 20, 7–9 p.m. This is a unique summer exhibition at the Newburyport Art Association. All art works executed on an 8” x 8” canvas. I have two paintings on display there! Three of my figurative works will be on display at the Foundation Art Space. My painting "Fog" was juried into the Newburyport Art Association Regional Juried Show. Artists Reception and Awards Presentation is on Sunday, May 6, 2-4p.m. Hope to see you there! Two of my painting are on display at the Newburyport Art Association Spring open show. This exhibit is filled with images of landscapes, people, and familiar scenes of everyday interpreted in two differing styles of professional fine artwork. Susan and Maria have collaborated to create an inviting array of work for you, and will be offering a selection of smaller works to help reach an audience looking for attainable original artwork at reasonable prices. Come and see fresh artwork that will enhance your home, add a personal touch to your décor, and make a lasting heirloom for generations to come. You may just find that one-of-a-kind gift for the upcoming holidays! Admission is free and they cordially invite you to bring family and friends for this gala celebration. Exhibition dates, Oct. 17 ~ Oct. 29., during gallery hours. Three of my painting are on display at the Buttonwoods Museum in Haverhill for the annual show. Happy to report that the 'Twilight' got the second place and the 'Deux Lunes' got the honorable mention. My painting "Power in Red" was accepted into the NAA show regional show and will be on display there now through beginning on June. Reception: Sunday, May 7, 2-4p.m. The mouse fairy is on display at the Brickbottom gallery. If you are going there for the Open Studios, don't forget to stop by and visit the gallery! Extended hours during Somerville Open Studios, May 6 & 7, noon - 6pm. I have two paintings on display! Stop by to see Deux Lunes and Wrapped in Gold. I'm very excited to participate in the 29th annual Brickbottom Artists’ BuildingOpen Studios—one of the oldest open studio events in Somerville. Thank you Shannon and Chris for the kind invitation to show in your studio! My painting "California Surf" was juried into the fall show at the Newburyport Art Association. The opening reception is Saturday Sat, Oct 15, 7-9p.m. Stop by the Newburyport Art Association to see the Fall open show, it's amazing! I'm participating in the GHAA art fair on Bradford, MA common. Stop by! Art Exhibit at Nunan Florist & Greenhouses Inc.
Artists from the Greater Haverhill art association spent 3 Sundays painting beautiful plants inside one of Nunan Florist & Greenhouses Inc. greenhouses. It was perfect! Nice and warm inside with so many beautiful plants to inspire! Now it's time to show the results! Come to the exhibit and the reception on Jan 31st noon-3pm. My Lili pond painting is on display at the Newburyport Art Association, now through February 6th. Stop to see the show! Visit me at the Union Crossing Open Studios! I'll have many of my paintings on display there as a guest artist. Get your artful gifts at the NAA Holiday Show & Sale! Lots of great art to choose from! Two of my paintings, Sarah and Saco River, NH, got juried into the Fall Show. The reception is free and open to public. Three of my painting are part of the GHAA Annual Open Exhibition that features over 90 works of fine art from over 40 artists. A reception is on May 30 from 3 to 5pm. Portraits of Merrimac, MA residents painted by local artists are on exhibit at the Merrimac Public Library until March 30, 2015. This exhibit is a great project by Mary Pyche. I was fortunate to contribute two portraits to this wonderful exhibit! The reception is on Saturday, Feb. 21st noon-2:00 pm and open to public. Two of my paintings: "Thank you!" and "Mt Daisen in the Clouds" are on display at the NAA. 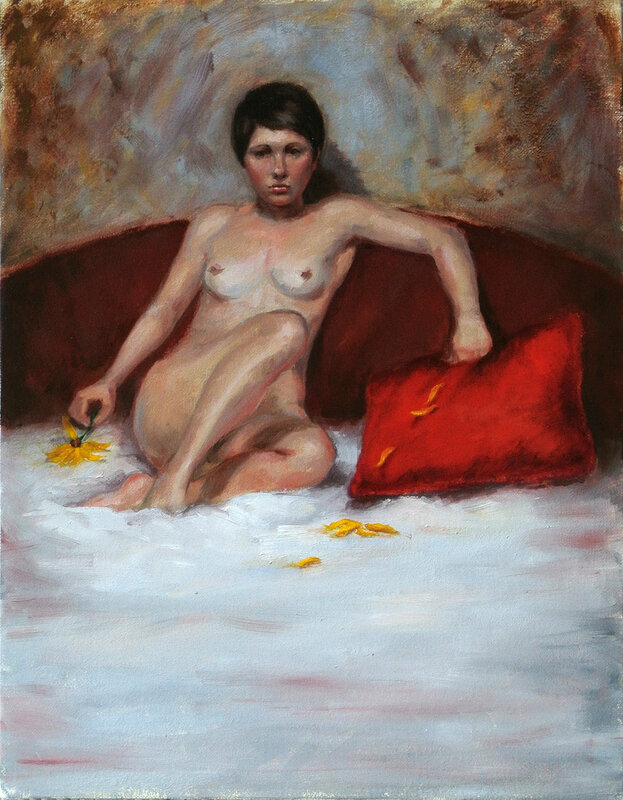 My figurative painting "Alone (wingback)" got juried into the this national visual art competition and exhibition of contemporary figurative painting, drawing and printmaking. Two of my painting are on display at the Haverhill Public Library. All images are copyrighted © by Maria Nemchuk. The use of any images from this site is prohibited unless prior written permission from the artist is obtained.